Look to the Blackhawk!® Sportster™ Muzzle Retainer to keep firearm muzzles securely in place during transport to and from the field or range. 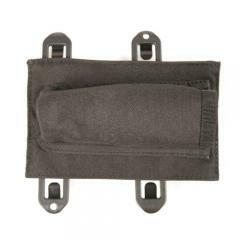 Made of durable and lightweight 600 denier polyester, the retainer is fitted with two #5 speed clips and designed to work with MOLLE platform webbing. Once attached, the Sportster™ holds fireman muzzles in place, keeping weapons from bobbing up and down in the carry case and evenly distributes weight, minimizing wear and tear on the case itself. A must-have accessory if you want to separate and carry two firearms, the retainer features a removable, padded divider and a set of pouches for stowing and organizing other shooting gear and small accessories.